Grated Cheese: mozzarella, parmesan, cheddar, Blue, whatever you have. Roughly chop your handful of fridge leftover vegetables. Cut the top ends of the Eggplants off, and boil them whole in a large salted pan of water for 5 minutes. You will see that they settle into a position where only one side will cook, so after 5 minutes, try to roll them over in the water and keep them on the other side, so they cook evenly. Boil for another 5 minutes. Run the eggplants under some cold water and leave on a chopping board to cool for a couple of minutes. Fry off the onions and garlic over a medium heat for about 5 minutes, then add your other veg, and gently brown. Take the eggplants and cut them in half lengthways. They will be hot, so be careful. Then you need to run a sharp knife around the inside edge of the skin, leaving a few millimeters to keep the shape of the eggplant whole. 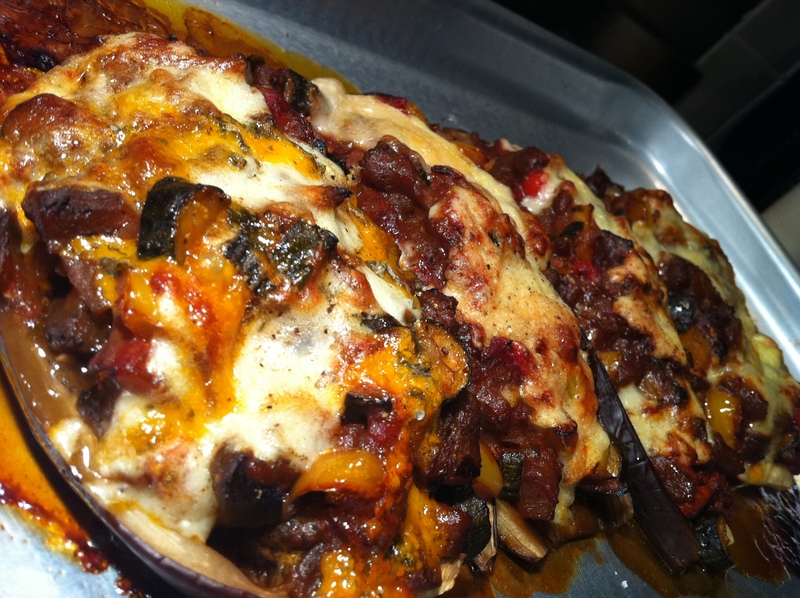 Chop the eggplant flesh into rough chunks and add to the frying vegetables. Season with salt, pepper and your herbs, add the tomato passata, sugar and vinegar and simmer for 5 minutes. Oil a baking tray, season with a little salt and pepper, and place the 4 empty eggplant skins onto the baking tray, skinside down. Fill equally with the vegetable mixture. Sprinkle your grated cheese over each filled skin, and bake 20-30 mins, or until golden on top.